The included photos of Marcel and Charlotte Kaufman were also used to complete the "Give them a Face" portrait collection (KD_00017) and the commemoration wall at the Kazerne Dossin museum. 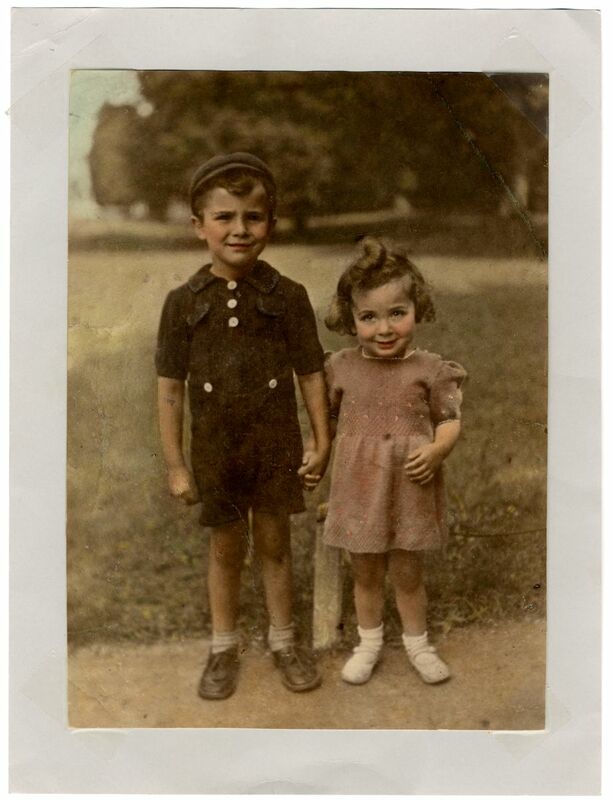 Mordechai (Marcel) Kaufman was born in Antwerp on 4 November 1936, his sister Chaya (Charlotte) on 18 March 1938. They were the children of Samuel Kaufman (b. 16/12/1905 in Korczyna, Poland) and Metel Leia (Mathilde) Rottenberg (b. 04/02/1909 in Bobowa, Poland). Samuel Kaufman had emigrated from Poland to Belgium in November 1928. He joined his father Abraham Kaufman in Antwerp to learn the profession of diamond cutter. On 11 June 1935, Samuel married Metel Leia Rottenberg, daughter of Salomon Rottenberg (b. 17/12/1883 in Berzeviczy, Hungary) and Ryfka Hass (b. 20/01/1884 in Bobowa, Poland). In 1940, Samuel Kaufman was able to flee from Belgium to the United Kingdom where he joined the British army. However, his wife Metel Leia Rottenberg together with Marcel and Charlotte remained in Belgium, convinced that the Nazis would not harm women and children. In the autumn of 1942, Metel Leia Rottenberg placed her children with a certain mister Merks, living at Kapellensteenweg 39 in Heide-Kalmthout, near Antwerp. She herself went into hiding at “Nieuwland”, which could refer to a family or to the Nieuwland castle near Aarschot, and survived the war thanks to an unidentified Belgian family. However, on 25 September 1942, Charlotte and Marcel Kaufman were arrested in Heide together with their cousins Miriam Stern (b. 09/09/1928 in Borgerhout, Antwerp), Herman Stern (b. 26/04/1935 in Antwerp) and Charles Stern (b. 02/06/1938 in Antwerp). These three siblings were the children of Abraham Stern (b. 18/07/1901 in Rosos, Czechoslovakia) and Anna Rottenberg (b. 13/11/1900 in Brezovica, Czechoslovakia), sister of Metel Leia Rottenberg. It is unclear if the children were handed over to the Nazis by the Merks family voluntarily or if someone denounced them. All five children were deported from the Dossin barracks to Auschwitz-Birkenau via Transport XI on 26 September 1942 and perished. Metel Leia Rottenberg’s father, Salomon Rottenberg, had passed away in Antwerp on 19 December 1941. Her mother, Ryfka Hass, did not survive deportation from the Dossin barracks to Auschwitz-Birkenau via Transport XXII B on 20 September 1943. Her sister Anna Rottenberg was murdered after deportation from the Dossin barracks to Auschwitz-Birkenau via Transport IX on 12 September 1942. After the war, Metel Leia Rottenberg was reunited with her husband Samuel Kaufman. The couple had one more child : Irene Nechama Kaufman, born in 1948. However, Metel Leia Rottenberg passed away when Irene was still little. Samuel Kaufman and his daughter Irene emigrated to Israel, where Irene still lives today. She got married and has children and grandchildren. Her father Samuel Kaufman passed away in Israel in January 1986. Irene Nechama Kaufman provided Kazerne Dossin with copies of photos of her deported siblings and maternal grandmother.